Question 1: Is there a need to have TSP agnostic platform to provide free data or suitable reimbursement to users, without violating the principles of Differential Pricing for Data laid down in TRAI Regulation? Please suggest the most suitable model to achieve the objective. The United Nations Special Rapporteur on the promotion of the right to freedom of opinion and Expression, Frank La Rue in his 2011 report has stated that “Given that the Internet has become an indispensable tool for realizing a range of human rights, combating inequality, and accelerating development and human progress, ensuring universal access to the Internet should be a priority for all States. Each State should thus develop a concrete and effective policy, in consultation with individuals from all sections of society, including the private sector and relevant Government ministries, to make the Internet widely available, accessible and affordable to all segments of population”.1 Thus, we as a nation have to take steps to ensure greater Internet access to the entire population. We believe that improving access is important, however the method adopted for it should be in tune with the principles of Net Neutrality and should make available the entire Open Internet to the users and not a select bouquet of services. So long as the entire Internet is made available and there is no discrimination of services or websites on the basis of content, it does not matter whether the platform used to provide free data services is TSP agnostic or not. 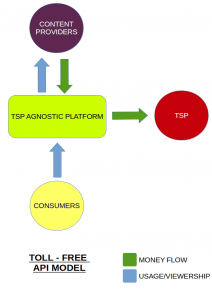 In fact, the premise for the idea of a TSP agnostic platform seems to be that such a platform cannot result in greater control for the TSP and will prevent the TSP acting as a gatekeeper. However, the free data models suggested in the paper will result in the bigger players controlling access. In such a scenario, instead of the TSP acting as a gate-keeper, various platforms offering free data will act as gate-keepers. The Internet is a great leveler and gives options for any service or startup to compete with an established player. However, if the bigger players are allowed to control the access of users and user behaviour by any means, whether through a rewards platform or through a zero rating service this will result in changing the nature of the Internet. Such approaches will destroy the permissionless innovation feature of the Internet that has resulted in startups like Google and Facebook succeeding. As per Tim Wu, models of development must not vest control in any initial prospect-holder, private or public, who is expected to direct the optimal path of innovation, minimizing the excess of innovative competition.3 This innovation theory is embodied in the end-to-end network design argument, which in essence suggests that networks should be neutral as among applications.4 The design of the Internet Protocol follows this end-to-end principle and this has ensured the success of the Internet. Thus, any model, irrespective of it being TSP agnostic or not, as long as it complies with the above regulation, by not differentiating on the basis of content & providing complete open access to the the full Internet and not parts of it will work in this context. Zero rating models do not contribute much to access. Research done by the Alliance for Affordable Internet shows that “88% of people using zero-rating responded that they had used the Internet before using the zero-rated plan. This means that only 12% of zero-rating users surveyed started using the Internet with their zero-rated service.” The study also reveals that “when asked what condition would be most acceptable to get “free data” or zero-rated data, a majority (82%) of users prefer to have the “free plan” valid for a short time or with a data cap, with no restriction on the websites and applications that can be accessed”.6 Thus, compared to free data plans that give restricted access or benefits for accessing parts of the Internet, a free plan that provides access to the Internet is more beneficial. For the purpose of answering the question we have done an analysis of the suggested models, if they are compliant with the current regulation, their pros & cons and other alternative models that may be used. 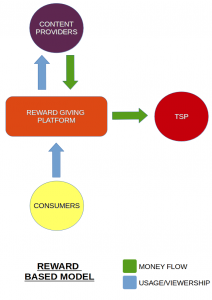 The reward based model will result in allowing the bigger players to control user behaviour by rewarding users for accessing their websites and services. This will be used as a method to subvert the restriction preventing discrimination of websites and services enshrined in the Prohibition of Discriminatory Tariffs for Data Services Regulations, 2016. Thus, the harm that the Regulations tried to prevent will manifest in another form. In this model, the users will be forced to use the websites and services that provide them rewards or data recharges. This will be to the detriment of other competing websites and services. In this model, the end result is the content provider paying for the data consumed by the end user. 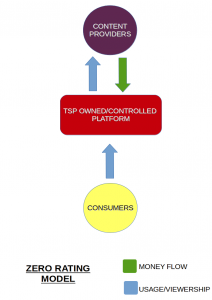 Instead of a direct transfer in the case of a TSP owned platform, the money gets routed to the TSP through another platform. This model is a Zero Rating model where the players with deep pockets will make their sites available for free. By adding an entity in between the TSP and the content provider does not change the nature of this tie-up and has the same effect as the content provider entering into a tie-up with the TSP. This is clearly in violation of the Prohibition of Discriminatory Tariffs for Data Services Regulations, 2016. 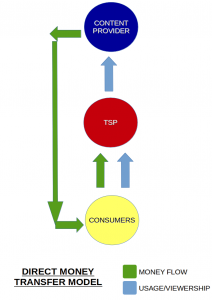 In this model also, the payment gets routed from the content provider to the TSP. This approach can be used only if the Direct Money transfer is controlled by the Government as a means for providing data to the less privileged sections. However, this should not be an option for private players to reimburse users for accessing their websites. If private players are allowed to reimburse users, then it will again be a case of content based discrimination, where a few sites, mainly the bigger players will get to control user access and user behaviour. Moreover, identifying users for the purpose of direct money transfer will also result in the violation of privacy rights of users. The illustrations given below shows that the suggested models in the consultation paper are in effect the zero rating model which was sought to be prevented by the Differential Pricing Regulation. The above models are a rehash of the "Sender Pays" Principle mooted by the European Telecommunication Network Operators Association (ETNO) which was rejected by even by the European Governments at the World Conference on International Telecommunications held in Dubai in December 2012. Such a proposal was even rejected by the Industry representatives from India. However, these models discussed in the consultation paper will in effect result in the sender paying for the data consumed by the user while accessing the website of the sender. We believe that any approach for providing free data should make available the entire open Internet to the user and should also not tamper with the principles of net neutrality that allow for competition and prevents discrimination. This is one of the versions of “equal rating” system rooted by Mozilla Foundation’s chairwoman Mitchell Baker.7 Each user gets a free pack each month for their internet usage, independent & on top of their own existing internet packs that they may or may not have. The free pack has a cap on the volume of data, like 500 MB per month. Similar model8 has already received success, wherein Mozilla has partnered with Orange in African and Middle Eastern countries where users purchasing a $40 (USD) Klif phone (which runs on the Firefox operating system) receive unlimited talk, text, and 500 MB a month for 6 months. This model provides the entire internet, with no restriction on volume or content, but operates on a 2G network. Thus, effectively this model makes the 2G Network a generic low-speed zero rated mobile network.10 This model is better for ISP bandwidth usage and easy on infrastructural demands. This method would enable people to access the Internet in public places by creating Wi-Fi hotspots from a single connection. Government, TSPs and Other Companies can jointly collaborate with certain venues like libraries, schools, gram-panchayat offices, railway stations, airports, public transportation systems & cabs to provide Wi-Fi connectivity & free internet to the public. Along with providing free Wi-FI, some of these venues can even act like community centres aimed at being a forum for digital literacy. Companies/TSPs paying for the data can get a 'brought to you by' attribution like the free pack or equal rating model & it can even be counted towards its CSR initiative. Question 2: Whether such platforms need to be regulated by the TRAI or market be allowed to develop these platforms? We think that a “mixed economy” approach will be better suited for such kind of platforms. Allowing market to develop such platforms can lead to innovative models. However, lack of regulatory oversight and complete reliance on market forces will lead to collapse of such models, lead to anti-competitive effects and will result in violation of the principles of net neutrality. Thus, a mixed economy approach that focuses on both innovation & net neutrality should be the way forward. As mentioned in our answer to the previous question any free data model should provide the entire open internet and should not be limited to a select bouquet of sites. Question 3: Whether free data or suitable reimbursement to users should be limited to mobile data users only or could it be extended through technical means to subscribers of fixed line broadband or leased line? Broadband is defined, as per Notification No. S.O. No. 4-4/2009-Policy-I dated July 18, 2013 issued by the Department of Telecommunications, “as a data connection that is able to support interactive services including Internet access and has the capability of the minimum download speed of 512 kbps to an individual subscriber from the point of presence (POP) of the service provider intending to provide Broadband service”. As indicated by TRAI's Indian Telecom Services Performance Indicators report for the quarter October – December 2015, out of the 331.66 million Internet subscribers in India, 311.69 million subscribe to mobile Internet services, while a mere 19.98 million subscribe to fixed-line Internet services.11 In other words, roughly 94% of Indian Internet users access the Internet through their mobile devices, leaving around 6% as fixed-line Internet users, indicating a clear preference for mobile Internet services over fixed-line amongst Indian Internet users. Moreover, the access and billing patterns of mobile and fixed-line Internet see wide variance between each other. Whereas the owners of all Internet-capable phones will have on-demand Internet access built into their subscription plans by default, fixed-line Internet requires prospective customers to approach service providers and purchase dedicated data plans along with the requisite customer-premise equipment such as modems and/or routers. In the absence of volume-based data plans, mobile Internet charges are levied on the basis of data consumed in given billing cycles. Fixed-line Internet subscriptions on the other hand, follow multiple billing systems, where subscribers are able to choose from both data-capped and uncapped plans. Subscribers of the former category are generally allotted monthly quotas of high-speed data, upon the exhaustion of which additional charges are levied according to the subscribers’ data use. Data-uncapped plans allot subscribers fixed quotas of high-speed data, upon whose exhaustion Internet speeds are restricted to baseline broadband levels albeit with no additional costs relative to data consumption. There are substantial costs to be borne by the customer in procuring a fixed-line Internet connection including equipment costs, installation charges, monthly rentals and the data charges themselves. As a result, any customer who is in a position to procure a fixed-line Internet connection to begin with will derive little to no value from free-data and reimbursement initiatives, where the amount of Internet use enabled by such initiatives will inevitably be significantly lesser than their paid counterparts. For the above reasons, it is our submission that any initiative aimed at bringing Internet access to those unable to afford the relatively high cost of data should focus on the mobile Internet rather than fixed-line Internet services. However, it must also be borne in mind that any future regulation concerning free-data or reimbursement initiatives must make no distinction between Internet access via mobile as opposed to fixed-line services. The Internet is the Internet irrespective of the mode of access, and there must be no differences in its regulatory treatment in this regard. Regulations are necessary for both mobile and fixed-line Internet services to avoid gamesmanship designed to avoid the Regulations against differential pricing promulgated by TRAI, and the regulator must consider if practices that invariably harm the open Internet work similarly on mobile or fixed-line services. Question 4: Any other issue related to the matter of consultation. In the Prohibition of Discriminatory Tariffs for Data Services Regulations, 2016, the proviso to Section 3(2) exempts data services provided over “closed electronic communications networks” (CECNs) from the general prohibition on differentially priced data services. While the proviso does make it clear that the prohibition would still apply if CECNs are leveraged in such a manner as to circumvent it, some industry players and consortia have been observed attempting to obfuscate this understanding by claiming a lack of clarity as regards the ambit and application of the proviso. We wish to submit that the Regulations in general and the proviso to Section 3(2) in particular are both well-grounded in reason, and leave no room for ambiguities in their interpretation. As per the Regulations, differentially priced data services offered over the open Internet stand prohibited at all times, whereas such pricing arbitrages in internal CECNs that are separate and distinct from the open Internet will be allowed and will attract no financial disincentives from the regulator. Attempts at circumventing this regulatory premise are easily identifiable as such – offering content from particular content providers at discounted rates over a CECN to the subscriber base of a TSP for instance, is a clear circumvention of the prohibition on differential pricing. That being said, we submit that it would nevertheless be beneficial in the interest of precluding further efforts at obfuscation and compromise to clearly outline the scope of exemption under Section 3(2) by way of illustrative examples of both permitted and prohibited uses of CECNs as a means of data delivery at differential tariffs. We reiterate that TRAI is the apposite sectoral regulator for the telecommunications industry, and having already laid down a model Regulation against differentially priced data services, the focus going forward must be on ensuring its sound implementation rather than entertaining unfounded exhortations for its reconsideration.